One of the key topics of conversation this year has, inevitably, been Brexit. Since the results of the UK Referendum on membership of the EU were announced in June, speculation, knee jerk reaction, panic, and uncertainty have been rife. What does it really mean for scholarly communications? Are the worse-case scenarios likely to pass? What are the worse case scenarios and what are the opportunities? ALPSP, the Publishers Association and The London Book Fair arranged a debate with leading industry figures to find out more. The conversation will continue at the Research & Scholarly Publishing Forum at LBF17 in March. 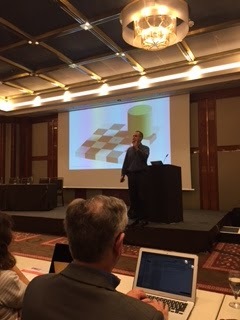 The debate, introduced by ALPSP CEO Audrey McCulloch and chaired by RELX Group's Richard Mollet featured academic consultant Richard Fisher and Andy Robinson, SVP and Managing Director for Society Services at Wiley. On a positive note, there are short term currency gains. There is an outside possibility of eliminating VAT on ebooks and digital products and potential to get government departments to support emerging markets and UK research to boost technology market, for example by rebuilding trials sector. However, there is also a risk of the UK becoming a regulatory island. In the short term, the audience were advised to keep an eye on any bump in book sales to check there weren't any inventory blips on a regional basis while the currency is in flux. Scientists for EU has collected examples of academics who refused positions in the UK. There are over 40 examples of researchers being taken off grant applications or made a contributor instead. In institutions, there are 31,000 researchers based in the UK who come from the EU. There is a long term question about how that will impact on the quality and impact of EU research. UK research is a strong contributor to the economy and if damaged could have a long term impact on other sectors. And the European Medicines Agency moving from the UK will have a converse impact on the pharma sector's appetite to launch drugs in the UK. Currently 2% of the world's clinical trials happen in the UK. There is an opportunity to rebuild that, which in turn will bring in pharma investments (GSK has invested £250m in UK since Brexit). There are a number of implications for the publishing industry and related sectors in relation to people. Ten per cent of the UK publishing workforce comes from the EU (compared to 6% in the wider population) and companies will have to consider how to manage that impact. It was noted that the current Prime Minister, Theresa May, was previously Home Secretary. During her tenure in that role she was very strict on the number of overseas students. It is unlikely this line will change and institutions are watching with concern. The knock on financial effect could be significant with 25,000 students studying in the UK - and 46% of postgraduates coming from the EU - generating income for institutions and local businesses. How does industry make the case to government without looking like they are moaning about the result? There was a strong reaction post-Brexit from researchers and publishers. We need to respond to the challenges robustly, but on new terms, by putting forward a strong economic case for investment. With three government departments across Education, Culture Media and Sport and Business that influence the world of publishers and researchers it might be tricky to navigate. There is no doubt that the UK now sits outside debates in EU, for example with open access and open science. Where Britain leads, the world does not necessarily follow so the possibility of isolation is very real. Wiley and ALPSP ran a short poll of their society publishers. in it, 80% of respondents saw the loss of influence in these policy debates, particularly around open science. In the long term there is possibility of a move to the older world of a US copyright regime, UK regime and EU regime, leading to potential fragmentation. Google will no doubt be watching with interest, particularly around Fair Use issues. The UK is unique in having access to millions of patient records, and if data protection issues can be navigated carefully, there is real research potential in monitoring patient outcome. We have the potential to become world leaders in fields such as stem cell research. What will we be talking about at Frankfurt 2021 in five years? Will it still be a big issue or just one of the things we’re dealing with? It is hard to predict. On the one hand, the British political situation is in such flux it is impossible to predict. We should have a much clearer path in 2021. On the other, it will be one of a number of issues that the industry will face. The industry should reflect on why they don’t employ, publish for or sell to the 52% of voters. June 23 is without doubt one of the most important post-war dates in British history. While there is a worrying flux at government level that will play out over the next two to three years, politicians need to wake up to the importance of research. The industry needs to encourage the UK government to take research seriously and place it at the heart of the negotiation. A national research strategy should be brought together as quickly as possible to ring fence funding up to 2025. 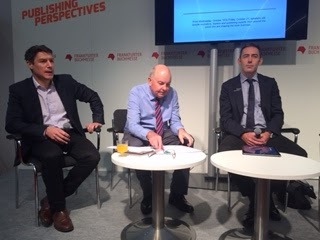 The Brexit debate at the Frankfurt Book Fair was organised by the Publishers Association and ALPSP with the support of the London Book Fair. 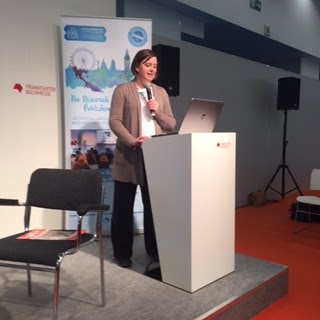 The discussions will continue at the Research & Scholarly Publishing Forum to be held at LBF in March 2016. Elsevier has launched a Brexit resource centre to provide benchmark objective data, useful links and other resources.